Here’s another really fun and simple recipe you can make with the kids for Valentine’s Day. 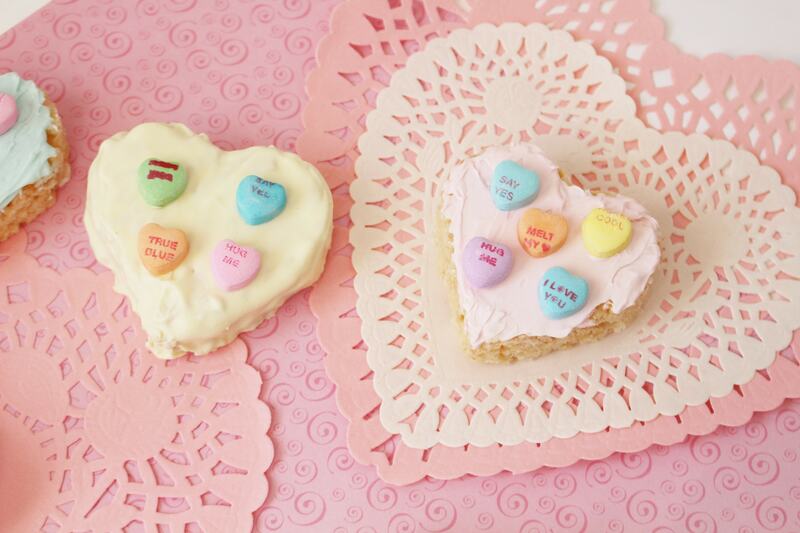 Rice Krispie treats shaped like hearts — how simple and fun!! Full instructions are below. 1. Spray a 9×13 pan with Pam and set aside. 4. Once the marshmallows are melted, remove from heat and stir in the cereal and salt until well-coated. 5. Using a rubber spatula (sprayed with Pam), transfer the cereal mixture to the prepared pan and press down firmly and evenly. 6. Allow the Rice Krispies to cool in the pan completely before the assembly process. 2. 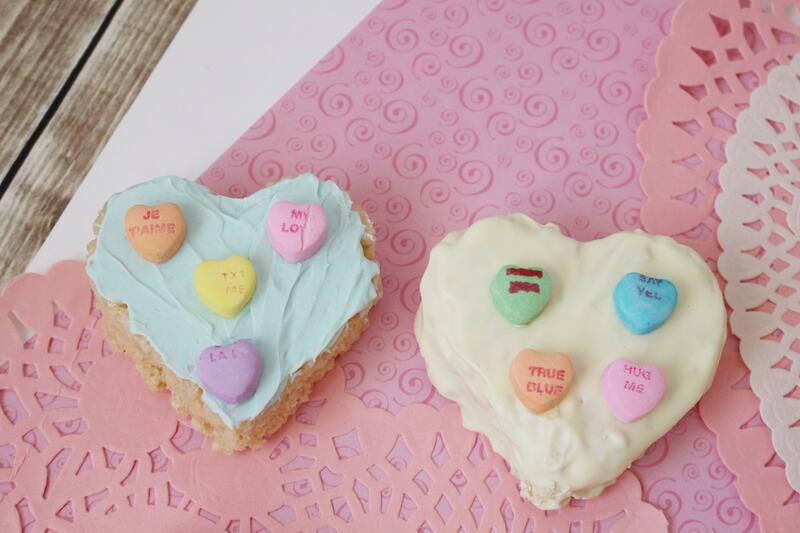 With a medium heart-shaped cookie cutter, cut out 12 heart shapes from the pan of cooled Rice Krispies. 3. In a medium microwave safe bowl, microwave the shortening for 45 seconds or until melted. 4. Add the white chocolate melts and stir until completely melted. Depending on your microwave, you may have to microwave an additional 8 seconds and stir to get the white chocolate melted. 3. Evenly distribute the melted white chocolate into the 4 small bowls. 4. Add one drop of food gel into each bowl to ensure a pastel color. 5. Dip the Rice Krispies hearts into each of the bowls and cover completely with the colored chocolate. 6. 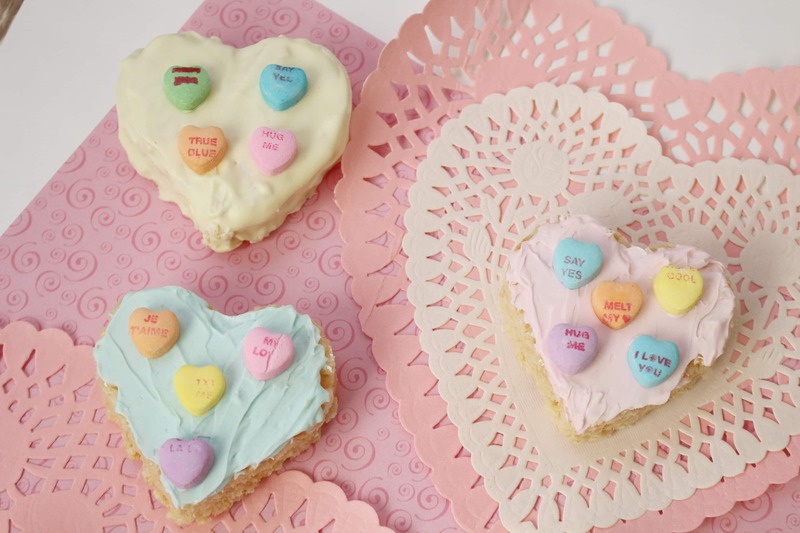 Set the hearts on the baking sheet to dry for approximately 30-40 minutes. 7. 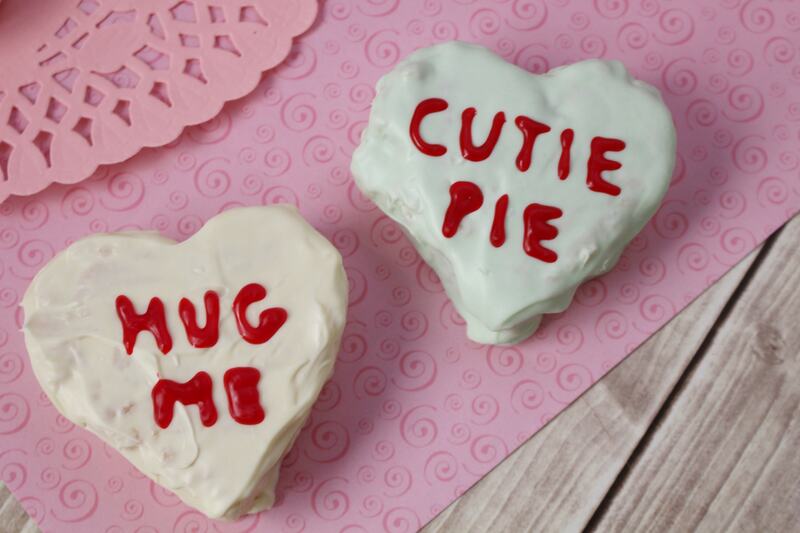 Using the Wilton red decorating gel, write cute sayings on each heart. Previous Post: « Stitch Fix Unboxing: What Did I Get This Month?